When it comes to blog post ideas, believe it or not: Stack Overflow has been a very influential part of my writing. I’ve written blog posts that were inspired by problems with cool solutions or niche features in a framework not many are aware of. Case in point, a question I recently answered on Stack Overflow had a solution that many who use the framework might not have thought of, as it delved into some constructs that aren’t immediately obvious to some. After answering, I was inspired to write a blog post about this because it seemed as though it would be useful enough for others wanting to do the same. Having also worked with Vue.js recently which has a similar check, I figured a blog post was needed. And herein lies the beauty of all this: Stack Overflow can help inspire you to write about something you might not have thought of. I am not saying that you should copy/paste other peoples answers because not only is that plagiarism, Google will penalise you for it. But it provides a barometer on the common pain points and problems that developers face, things that matter. It doesn’t just stop there. I take inspiration from chatter on the Aurelia Gitter chat to write up useful blog posts on Aurelia, based on what people are getting stuck on or want to know. I have also been known to lurk Github issues for blog post inspiration. Heck, even Twitter can be a source of inspiration. Instead of thinking of what your target audience might want to read, seek out what people want to know and write the content for them. Cliche, but if you have an idea write it down somewhere (even if it is just a potential blog post title). I use Dropbox to store all my post ideas (written in Markdown) and when I get inspiration I create a new Markdown file. 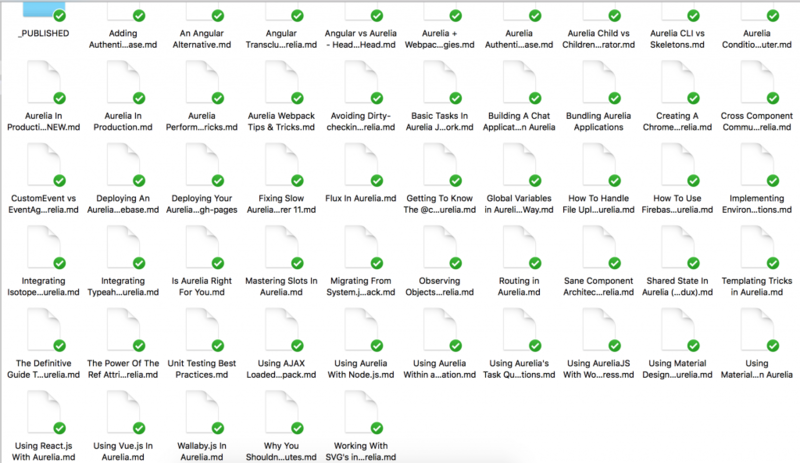 Take a look at my Aurelia Dropbox folder, there are posts in other folders (not pictured) but you can see I have a tonne of ideas and some of these are partially written, some are just titles with no content at all. I might not finish any of these, but it gives you insight into the process. Done any work on the book lately? Last release was about two weeks ago, so yes. There is a large update coming to coincide with Webpack support being added into the Aurelia CLI. So the book is being updated to reflect that as well as new applications you get to build and more.